After eight years of waiting, we’re only a few days out from the release of Red Dead Redemption 2. Naturally, that means information about it is being leaked out into the world. 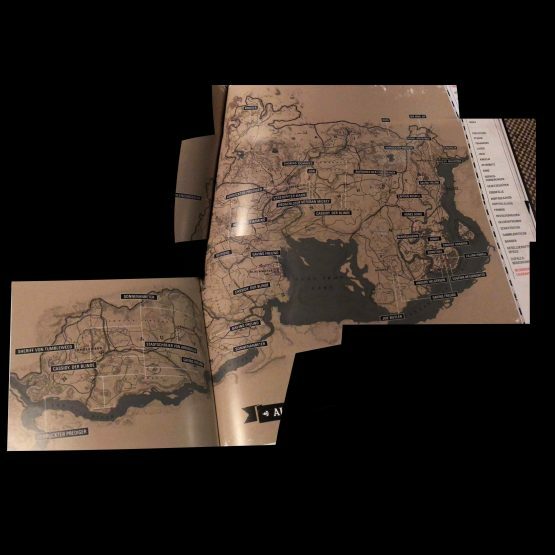 What appears to be the full map is out in the wild, and as expected, it’s quite big. If you don’t want to spoil yourself, it’s probably best to just turn away now. Okay, last warning. Here we go. The most notable fact is likely going to be that the majority of the Red Dead Redemption map is featured, which was previously rumored. Mexico isn’t shown on that map, although Rockstar could always be saving it as a surprise. What will be interesting is seeing how the locales contrast with Red Dead Redemption, which this game is a prequel to. Tumbleweed likely won’t be a ghost town, but what will it be like in the year 1899? Of course, it’s hard to truly get an idea of the map’s size just by an image, but it’s still impressive. It’s not just the size of the map, either. This world is going to be feature animal species and bustling cities galore. With an impressive file size, this world is certainly going to be filled to the brim. Red Dead Redemption 2 releases on October 26, 2018 for the PlayStation 4 and Xbox One. Although, you may be able to buy it early from some stores.